After a month off, Meet a Museum Blogger is back (note: I’m always looking for new bloggers to feature)! I am beyond thrilled to share with you the joint profile of the dynamic duo behind one of my favorite blogs, The Incluseum: Aletheia Wittman & Rose Paquet Kinsley. Aletheia Wittman received a BA in Art History/Minor Visual Arts from the University of British Columbia and an MA Museology from the University of Washington. Her thesis research reflects on US art museums that identify community engagement and/or social justice as priorities and includes interviews with curators in these museums about how they engage with these priorities. Rose Paquet Kinsley was born and raised in French-speaking Belgium and received a MA in Museology from the University of Washington, and is currently pursuing doctoral studies at the University of Washington’s Information School. She has 6 years of museum work experience, which has included working for a tribal museum and a museum without walls in Alaska, a community-based museum in Seattle, and the National Parks Service. Her thesis work centered on the question of how museums can engage with and make their resources available to adults experiencing homelessness. Rose is interested in how museums can be more inclusive, flexible, and participatory. For more biographical information Aletheia and Rose, click here. Rose (R): Although I’ve worked in museums for the past 6 years, I am currently a first year PhD student at the University of Washington’s Information School (iSchool). In my work, which is both theoretical and practical, I investigate how museums can be more inclusive, flexible, and participatory. Aletheia (A): I am a public programmer at the Seattle Architecture Foundation (SAF), an organization with the mission to connect the public to the architecture, design and history or Seattle. There are some parallels between museum work and what I do at SAF, for example we produce a yearly exhibit. Our home office also has a permanent gallery exhibit on Seattle’s architectural history, but SAF does not have a collection and wouldn’t consider itself a museum. R: I studied history as an undergrad and later pursued a masters in Museum Studies. It is during the course of my masters that Aletheia and I met. A: Pretty close to Rose – I studied art history and got a minor in visual arts before deciding to pursue Museum Studies. R + A: The Incluseum’s turning point, or when the idea went from being a thought to a reality, was a casual conversation we had over a beer a little before our graduation from our Museum Studies program. We were talking about “wouldn’t it be great” to have a resource that had all the latest ideas, from theory to practice, about how museums were being socially inclusive, responding to contemporary events and community needs, and confronting their own contributions to systems of inequality and social exclusion. Lots of people were discussing these things, but there were lots of missed connections. In that moment it felt like, “yeah, this is something we can do.” It didn’t feel imposing and felt fairly natural to create the blog at that point. We also had more time then, having just finished school, so we had the ability and excitement to put lots of energy into getting the Incluseum started and building a small platform of awareness through social media and telling our friends and colleagues about it. The things we needed to get started just lined up well for the Incluseum! R + A: As you’ve already gathered, the name of our blog is the Incluseum, which was imagined by blending two words: Inclusion and Museum to capture our mission of encouraging social inclusion in museums. A friend suggested this name and we thought it was perfect for referring to complex matters in a more playful and light-hearted manner…although we believe our work is important, we wanted to avoid sounding too somber or stuffy. The Incluseum represents our dream museum; one in which issues of social inclusion are central and shape the future standard for museums. We’ve been blogging away since July 2012. R + A: Our blog posts are all focused on issues of social inclusion in museums (read more about how we define social inclusion in museums). For example, we’ve had a number of posts that looked at how museums are tackling issues of race and racism and how museums are taking steps to intentionally collaborate or work with individuals who’ve traditionally not had a voice and presence in museum spaces (e.g., latino families, homeless adults, and individuals with physical or cognitive disabilities). Although we occasionally author blog posts, our role has been primarily as facilitators and coordinators. Our goal with the Incluseum was to create the first collaborative platform where anyone experienced in matters existing at the intersection of museums and social inclusion could take the stage and share. We felt strongly that creating such a forum could help make socially inclusive projects and research more visible and useful to those who wish to pursue similar goals. This blog is one way in which conversations and projects about inclusion in museums can be collected and made more accessible, as well as addressed expeditiously. We hope that documenting these areas of practice and research will promote community around this topic and contribute to building a stronger foundation for socially inclusive practices in museums. Where do you see yourself (the Incluseum) in 10 years? A: Wow 10 years is a long time! Though I think Rose and I hope to be around doing the Incluseum in 10 years, the farthest we have gotten in concrete discussion is what could happen in 1 year. I think we have goals that make sense for a 10 year plan though, if not sooner. One recurring goal has been to turn our ideas for transformation in museum practice into a real time project where we explore what it means to create an “Incluseum.” That will likely be happening within this next year though… We have also talked about what it means to have an “Incluseum” space where we explore our ideas from/within a permanent space with, you know, 4 walls and everything. I think we are interested in what it means to be an inclusive museum without walls and with walls and what the strengths and weaknesses are of both those models in terms of what you can achieve in more inclusive museum practice. A: We do tweet! For us it has been an affordable and useful platform for connecting to other bloggers, professionals, students etc. It takes a lot of time to tweet sometimes but it has been a great way to promote and get promotion for recent blogs and issues the Incluseum is exploring. We feel supported by our followers and those we connect to on twitter and we have been really intentional about using twitter as a tool to reach out to people who we truly hope to connect to in ways beyond the twitterverse. Twitter has proved to be valuable to a small project like ours. You can find us at @incluseum. 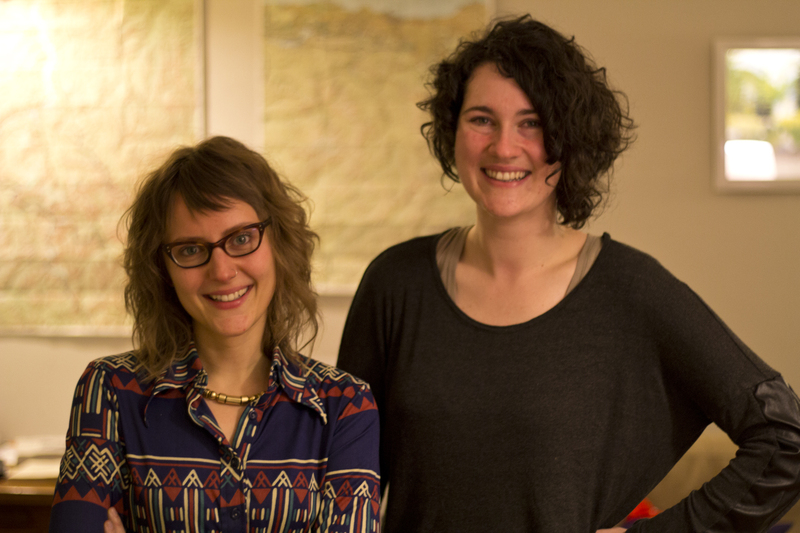 Thanks for participating in Meet a Museum Blogger, Aletheia & Rose! In case you missed it, Aletheia & Rose blog at The Incluseum. Do you have additional questions for Aletheia & Rose regarding their profile above? Feel free to start a conversation in the comments below or reach out to them directly on Twitter at @incluseum. Please use the #MuseumBlogger hashtag. TY! Tags: Aletheia Wittman, museum studies, National Parks Service, Rose Paquet Kinsley, Seattle Architecture Foundation, social inclusion in museums, The Incluseum, University of British Columbia, University of Washington. Bookmark the permalink. Thanks to Jamie Glavic and Museum Minute for their feature on the Incluseum, part of the “Meet a Museum Blogger” initiative. Find our reblog of the post here and remember to check it out on Museum Minute as well. Jamie — I really like your blog and missed it while you were away.